EPEC inhibits Cl–/OH– exchange activity. (A) Caco-2 cells were infected with EPEC or nonpathogenic E. coli in the cell culture medium for 3 hours. Cl–/OH– exchange activity was measured in base-loaded cells as DIDS–sensitive (300 μM) 36Cl– uptake. Results represent mean ± SEM of 9 separate experiments performed in triplicate. *P < 0.05 compared with control. 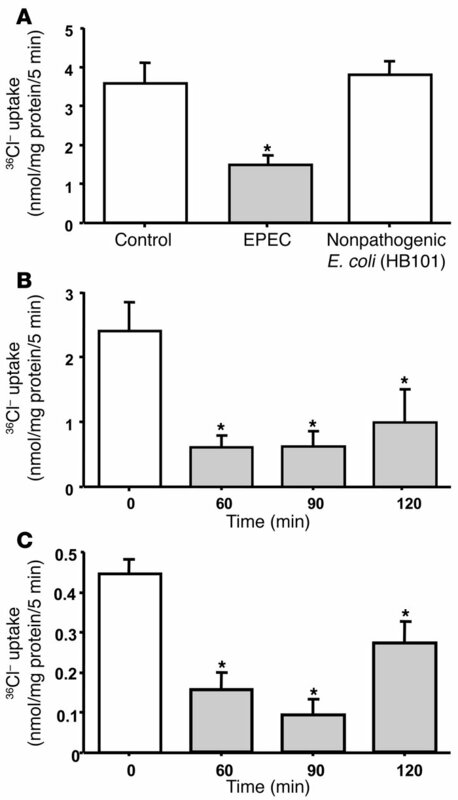 (B) Time course of Cl–/OH– exchange activity inhibition by EPEC in Caco-2 cells. Results represent mean ± SEM of 6 separate experiments performed in triplicate. *P < 0.05 compared with control. (C) Effects of EPEC are not cell line specific. T84 cells were infected with EPEC for 60, 90, or 120 minutes, and Cl–/OH– exchange activity was measured as DIDS-sensitive (300 μM) 36Cl– uptake. Results represent mean ± SEM of 3 separate experiments performed in triplicate. *P < 0.05 compared with control.